A wild herb from the Mediterranean, sage is known for restoring vitality to the body and is said to aid longevity, so it is perhaps appropriate that sage is a perennial shrub. Sage has been used since ancient times for warding off evil, snakebites, increasing women's fertility, and more. The Romans likely introduced it to Europe from Egypt as a medicinal herb. Theophrastus wrote about two different sages, a wild undershrub he called sphakos, and a similar cultivated plant he called elelisphakos. As a kitchen herb, sage has a slight peppery flavor. Sage leaves are traditionally added to rich meat dishes such as roast pork and poultry, and are especially delicious in stuffings or dumplings. For use in other meat dishes (like stews or casseroles) fresh sage leaves can be chopped and frozen into ice-cubes. An ice-cube or two can then easily be added to a dish, for good effect. 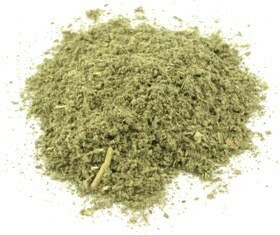 The flavour of leaves is quite strong and peppery so sparing use is recommended. A touch is always welcome in cream or milk sauces, with tomatoes, salads or with cream cheese spread in sandwiches. In Western cooking, it is used for flavoring fatty meats, Sage Derby cheese, poultry or pork stuffing, Lincolnshire sausage, and in sauces. 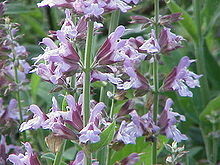 Sage is also used in Italian cooking, in the Balkans, and the Middle East.